For many people, both artists and non-artists, being creative seems synonymous with being aloof, isolated, and lonely. For an artist, being alone most of the time is even considered necessary in order to create their best work. It seems that we have all heard, or have come into personal contact with, statements like these as an artist. A quick analysis of these indicate they assume a lot about the artist’s motives, that they feel left out of the artist’s mysterious process, and even seem a little bit plaintive or presumptuous. According to Goethe and Monet, a degree of solitude is necessary to create significant and important work. West seems to take the need for solitude to a whole new level, even categorizing those around her as enemies. Writing, for her, must require her to “savagely” insist on being alone at all costs. In addition to these statements by both non-artists and artists, there are societal and cultural practices that cause us to lean towards the artist as a lone figure. Schools, from the elementary level all the way to the university level, do not tend to teach creative collaboration very well. Students are graded individually on their own projects. However, most creative jobs in the real world require some degree of teamwork, and many graduates are unprepared for this. This is unfortunate, and it leaves creatives entering the job market with some catch-up to do in order to work effectively with a team to complete creative assignments. To some degree, I understand why this shortfall of preparation exists. The school faculty has to be able to accurately judge the progress of a student, and unfortunately a number or letter grade is the lowest hanging metric to be able to judge and convey this. If the student collaborates with other students on projects, how can they be accurately evaluated so that a progress report can be sent home to the parents? 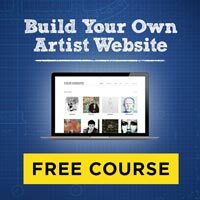 Perhaps more comprehensive methods need to be employed that can help artists evaluate their progress while still preparing them for a world where it’s not just them and a few instructors. There is an assumption that the old masters of the Rennaissance worked in silence and solitude. An image comes to mind of poor Michelangelo, lying on that Sistine scaffolding as paint dripped in his eyes, suffering alone in the heat. The Myth of the Lone Artist as well as the Myth of the Genius Artist may well have been birthed in these times. This is when an artist’s status rose above other craftsmen and they became cultural icons, exercising a large influence over politics and life. It seems necessary that the names we remember the most, as we are taught in our art history classes, become separated and unique from their peers in order to elevate them to such status. But while certain artists were creative hermits, this is simply not true, especially in Renaissance times. Many artists trained and employed assistants in large studios who not only prepared materials, but even painted full works to which the artist simply signed his or her name. While this is controversial (and to a large degree unprovable) it is certainly not as romantic an image as the loner genius artist, which is probably why nobody really talks about it. For quite some time the idealized figure of the lone wolf artist has existed as a cultural icon. From 18th-century literature to modern movies, the isolated artist is presented as something of an emotional lightning rod: someone to envy, desire, love, or hate. They are envied because of their special talents, desired because of the same, loved when their creative product is liked, and hated when it’s not. Many times isolation is in both their art as well as their personal life. When you examine these figures and their work, you see that isolation is a state of mind that is not necessarily put into practice all the time. At some point they seek out the fellowship of other people, even if it’s on their own terms. Okay… so it must be true. Artists, non-artists, and the culture have spoken. Creative people are to be alone in order to drum up anything of significance. Artists are doomed to not only live and work in utter, absolute silence in order to make anything significant, but they have to actually enjoy their little self-imposed prisons. While it’s certainly true that the intensity of the creative process may require solitude at times, I think the value of collaboration and communication with other people is understated. The alluring view of the lone artist causes an imbalance of perception. This unbalanced view causes many artists, especially ones starting to find their creative voice, to feel like there may be something wrong with them if they don’t want to spend all day and night by themselves creating. 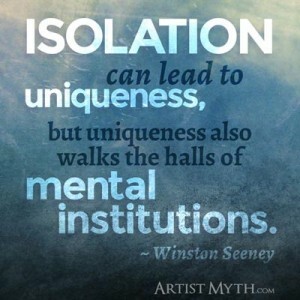 While isolation seems a necessity to some degree, it’s also dangerous. Artists who go to the extreme and insist on isolation all the time are in danger of losing themselves in their own self-created worlds. The double-edged sword of isolation can cut in favor of the artist, giving them uniqueness, productivity, and a great body of work as well as the satisfaction that they are actively engaged in the creation process on their own terms. But it can also cut the other way as well, and harm the artist who wields it carelessly… by causing them to become withdrawn, leave them without nurturing relationships, and produce loneliness and depression. At the very least, and even in the most extreme cases of isolation, artists seem to seek out like-minded creatives. It’s as if we are moths drawn to a flame… we may try to create light in total darkness, but it’s essentially impossible to do so. Before we know it, our steps take us to those we like, admire, and draw inspiration from. And that’s completely natural. Some of the best artistic works come from active collaboration between artists. One of the most famous examples is the songwriting duo of John Lennon and Paul McCartney. While they obviously had a great amount of individual talent, their collaboration gave us some of the greatest musical treasures of the last century. Even painting has not always existed in the vacuum of a solitary person. One famous example here is the long term creative partnership of Warhol and Basquiat from 1980 to 1985. These two artists’ wildly different backgrounds presented an interesting juxtaposition. Writing partnerships exist in plenty… one that comes to mind is the modern-day duo of Sean Platt and Johnny B. Truant. These two fiction writers also have a website and a podcast where they share openly their process, which leads to an amazing volume of work. They seem to have figured out the exact balance of individual effort versus working together, maximizing their talents as writers as each one does the part they’re best at. In the book Fiction Unboxed, they let us see step by step the entire process of two prolific authors working together on a novel from start to finish. When one digs into the previous examples of collaboration, it’s apparent that isolation is only evident in certain times, when quiet reflection and the early part of creative production is needed. There is a time later, when the individual has already drafted out an idea, that they present it to their collaborator for feedback or even to hand it off completely for the other artist to finish. In the best cases, there is an equilibrium present that results in the minimizing of individual flaws and the maximizing of their talents. This results in what is called, to borrow a cringeworthy term from corporate America, “synergy”. This means the result through working together is often greater than the parts. One plus one doesn’t just equal two; it equals three, or five, or eleven. When artistic collaboration is healthy and in full swing, the individual’s efforts cease to become their own and become something new and exciting. This may result in a feeling of loss for an artist who wants to possess recognition for their efforts, and in many cases this is true… the better end result is the result of some sacrifice of individuality. This is ultimately a decision each artist has to come to terms with in their own way, and determine how much sacrifice they want to get the end result they desire. Collaboration in this way, of course, doesn’t always result in success; many are the examples of co-creative efforts that crashed and burned before even getting off the ground. Maybe greater effort is required on the part of artists (and better training) in order to be able to accurately asses their own personalities as well as those of others. What seems to be weird chemistry is actually quite predictable to those familiar with the science of administering and analyzing personality profiles. Not only is it important to come to terms with professional collaboration, it’s essential for an artist to have peace with their personal relationships as well. A sad, depressing result of the “lone artist” figure romanticized in pop culture is the fallout of their personal relationships. In the worst cases, not only does the artist suffer from their self-imposed isolation, but their loved ones do as well. This has the danger of affecting our own idea of what a “real” artist is, resulting in us consciously or subconsciously putting artistic goals above other people in our lives. Does this have to be the case? Does creative success come at a cost of personal relationships? I strongly believe it does not. 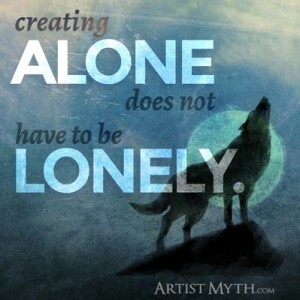 Creating alone does not have to be lonely. 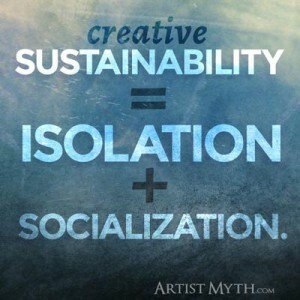 On of the themes I talk about frequently in the Artist Myth is sustainability. No, it’s not another corporate power-word… it’s more in line with the sustainability talked about by conservationists who care about the world we live in. Simply put, it describes how biological systems remain both diverse and productive. What better way to describe the “biological system” that is an artist’s life? While diversity comes from our past, and we may not have had a great degree of control over where we come from, productivity is more concerned with our present and future… and over it we have a lot of control. Productivity describes how we synthesize our relationships with those around us and bring them into the balance needed for maximum creative output over a long period of time. When I first became a Visual Effects Artist years ago, it was exciting and fun. The honeymoon period of working on projects that were both fun and professionally rewarding was intoxicating. Because I wanted to (and, frankly, because the job demanded it) I ended up staying late many evenings to work on those projects. In the short term, this seemed a good idea because I quickly learned more skills and accomplished more projects. However, my personal relationships took a toll as a result, most notably my marriage. Many other artists in my industry can identify with this struggle between family and work. I eventually learned (and continue to learn to this day!) how important it is to achieve a balance between my personal life and my professional life. While my relationships with loved ones are very different than the people I work with, I have learned that the best way to improve the work I do, ironically, is to leave it and go home. This helps me recharge my batteries and be with my family and friends, have some personal life away from work. Then, when I return to work, my mind is clear and more objective about what I’ve been working on. To be honest, I probably thought about work while at home or on the way to and from the house… but those thoughts were not from being “in the trenches” at work. I was able to get ideas and solutions to problems in a more objective way. So not only do I win because I arrive more energized and refreshed at work, with plenty of ideas… I also win at my personal life too, because I was able to put time into those I love. I admit it’s an ongoing battle to achieve that balance (especially when both areas have emergencies or deadlines at the same time!) but I know now how important it is, and everybody at work and at home knows that I am dedicated to making that balance work. My life feels (and is) sustainable because that balance has, for the most part, been achieved and I work to keeping it. I continue to see some artist friends struggle with this and offer my advice when I can. They think that they have an endless supply of personal resources and that the later they stay at night, and when they work on the weekends, that they are putting themselves in a better position professionally. But the truth is that they are putting themselves on a path to burnout from overwork and depression that comes from having no significant personal relationships outside of work. As you’ve read this article, it could be that something resonated with you. Perhaps you live in a self-imposed isolation because you feel that others take away from your ability to work. Or maybe you struggle with a sustainable level of balance between creative work and family. Or maybe you stay away from collaborating with fellow artists because you don’t want to give up to much. If you find yourself unhappy and unfulfilled due to an imbalanced lifestyle, then it’s time to start seeking equilibrium. If you’re battling depression or loneliness then it’s time to come out of the “creation cave” and seek fellowship with other people. Maybe you first entered the cave because of a personal hurt you received that you never dealt with. In any case, you need to understand that a social imbalance is not healthy. It is not something we can sustain over the long term. We’re made to need other people, even artists. I know that goes against many things the culture tells us… it says that we need to be “our own person”, to “travel our own path”, and to “find happiness apart from other people”. But while this may feel successful for a time and fill us with pride, our own self-sufficiency can also kill us. 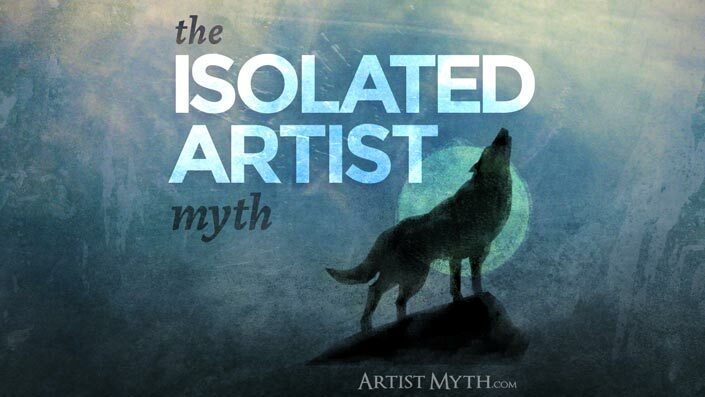 Will You Be A Victim of the Isolated Artist Myth? It’s time for some serious self-examination. It might be a good time to put the paintbrush, keyboard, or pencil down for a minute and tell those you love that you love them. It may be time to take break or a vacation with the family. Or it might be time to jump in the car or subway and go visit someone that you’ve been avoiding. The key to being a happy artist is being able to find and sustain that balance of people vs. work, aloneness vs. socialization. Finding it will lead to greater happiness, more professional success, and a higher degree of satisfaction with your life. Give to others through your art. And seek to enrich the lives of others through your personal life. Don’t give into the myth that you don’t need people, that’s a path down the wrong road. It’s better to come to terms with why those relationships don’t exist in a fulfilling capacity than it is to avoid them altogether. I know that the balance you seek will be found when you make a dedicated effort to find and maintain it. What better time is there to start than now? I wish you well with not just your creative journey, but for health and happiness for those walking beside you too.